We’ve had an early spring this year, and I’ve been noticing more weeds and more unusual weeds in my yard as a result. I hope others are not having this problem, but in case you are, I’m going to do a weekly feature on the weeds I’m finding — this could take all summer! Let me know if you have a weed you would like to have covered. 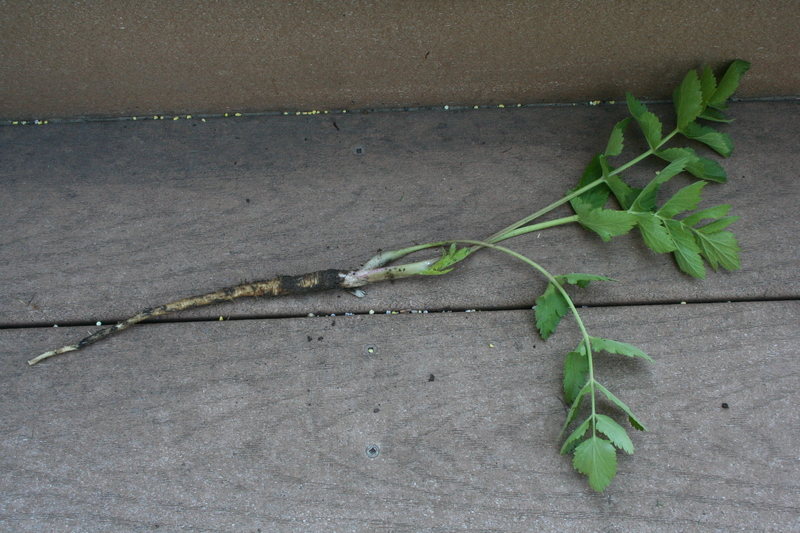 Note the long, parsnip-like root. This week’s weed is one that has long been a problem in parts of my yard, but has really gone crazy this spring: Wild parsnip (Pastinaca sativa). Wild parsnip is pretty easy to identify, though it does look a bit like a native called prairie parsley or wild dill. It has fern-like leaves that come up in early spring. 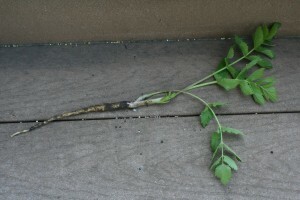 If you pull the weed, you can see its taproot, which does indeed look like a parsnip. According to the Minnesota Department of Natural Resources, wild parsnip will stay in this plant stage for more than one year, then flower on a tall, grooved stalk. The flowers resemble Queen Anne’s Lace, but have small yellow flowers arranged in an umbel fashion. If you see the flower heads, cut them off! Seed can survive in the soil for up to four years. Wild parsnip also can cause phytophotodermatitis, which means if you touch the sap and are out in the sun you can get a nasty rash. Always wear gloves (and long sleeves!) when dealing with this plant. Prevention is the best control method. The DNR says that in established prairies you can leave the wild parsnip alone and it will be out-competed by other prairie plants. In distrubed areas (this is what I have), you can pull plants. If that’s not possible, remove the flowerheads before they go to seed. Wild parsnip is a prohibited noxious weed in Minnesota. For more information on wild parsnip, check out this page from Minnesota Wildflowers, a volunteer-run site about native plants here. This is fascinating. I keep making resolutions to know my weeds better. I think I might have this. The rain has stopped, briefly anyway, and I am going to look. I’ll be careful of the sap though.